In a shock development, one of the Presidency Council (PC) deputy heads, Musa Koni has resigned. On TV, he said that the Council had failed to deliver. “I’m resigning because I have failed,” an emotional Koni said. It is also reported that Arif Khojja, the PC’s interior minister, and the planning minister Al-Hadi Al-Juhaimi have also resigned. It is thought that a series of appointments announced by the PC over the past day were the final straw for Koni who had threatened to resign some months ago. It is believed that he made his decision without telling any of his PC colleagues in advance in order not to allow them to pressurise him to remain. The appointments were made by one of the other deputy presidents, Fathi Majbri, in his capacity as acting head of the PC while Faiez Serraj is away in London attending a family wedding. 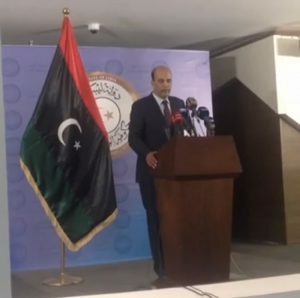 They include new ministers of economy, justice, finance and national reconciliation to replace those sacked because they did not turn up to PC meetings in Tripoli. Also appointed are a chief of staff (Salem Juha) , a head of intelligence (Fathallah Hussein Saiti), a counter-terrorism chief (Brigadier Mohamed Mahmoud Al-Zein) and a head of anti-illegal immigration operations (Abdul Qader Al-Tuhami). The appointment of the Saiti and Tuhami are potentially controversial. Saiti is the head of HoR’s national security and defence committee, and was previously close to Khalifa Hafter but was not happy when Ali Gatrani was picked as PC deputy, not himself. “He is not up to the job”, said one Libya analyst. It is alleged that Tuhami, a former member of Qaddafi’s Foreign Security Department, is one of the main suspects in the killing of British policewomen Yvonne Fletcher outside the Libyan embassy in London in 1984. Koni’s resignation poses a massive challenge not only to the PC but also to the Libyan Political Agreement. It is thought very unlikely that he will change his mind and there is every chance that the PC boycotters Ali Gatrani and Omar Aswad will now follow him. It will also be very difficult for the dialogue team to appoint replacements. The resignation is likely to set the LPA unraveling.